"Art Publishers to Their Majesties the King and Queen"
"Two different styles of Mississippi Steamers." Published by F. v Bardeleben, New York. Made in Germany. Raphael Tuck & Sons' postcard Series No. 23709 "In the Land of Cotton. "ART PUBLISHERS TO THEIR MAJESTIES THE KING AND QUEEN. Owned by the Parisot Line. Operated on the Yazoo River. She was a cotton packet. Still listed as of 1886 and perhaps later. 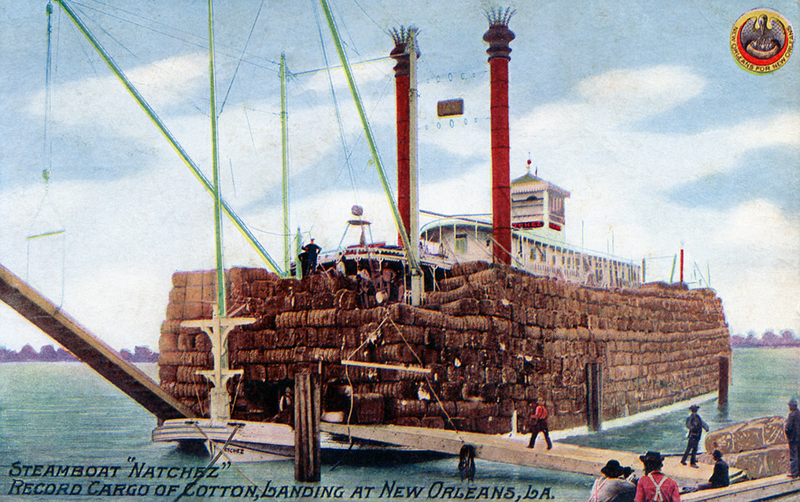 Colorful postcard from my collection of the sternwheel cotton packet NATCHEZ published by F.M. Kirby & Co. New Orleans post marked 23 Sept 1910. Have not been able to determine how many bales were in her "record cargo of cotton." 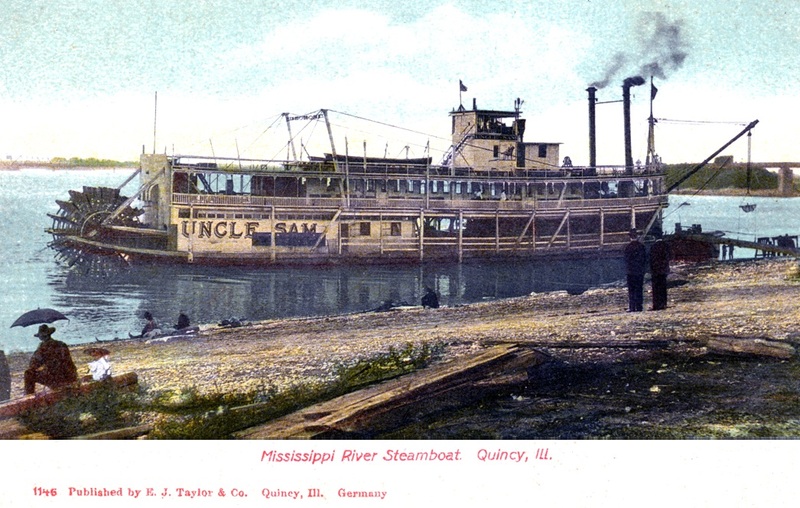 The previous nine steamboats named NATCHEZ were all sidewheelers. This boat, built in 1891 was the first sternwheeler named NATCHEZ. Original price of Natchez was $43,000 and her home port was New Orleans, Louisiana. Owned by the aging T.P. Leathers, the Natchez was commanded by his son, Captain Bowling S. Leathers and his daughter-in-law (Captain Bowling's wife), Captain Blanche Douglass Leathers. Captain Blanche obtained her license in August 1894 and she was a no-nonsense executive and ran a tight ship. Captain T.P. died in New Orleans, June 1896. 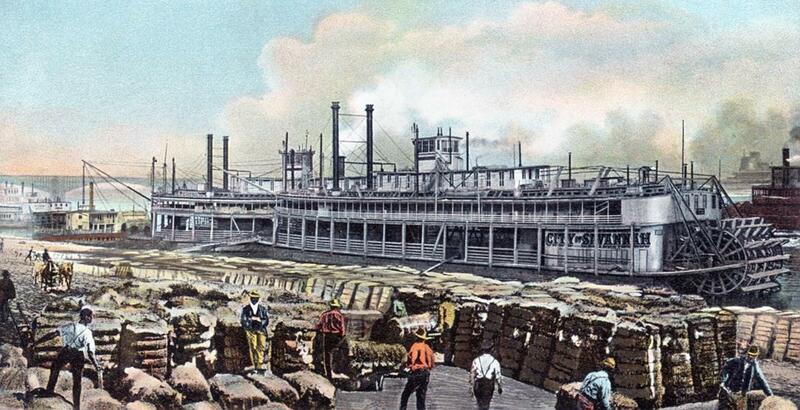 The Natchez was the only sternwheeler ever owned by the Leather's fleet and was their last boat. 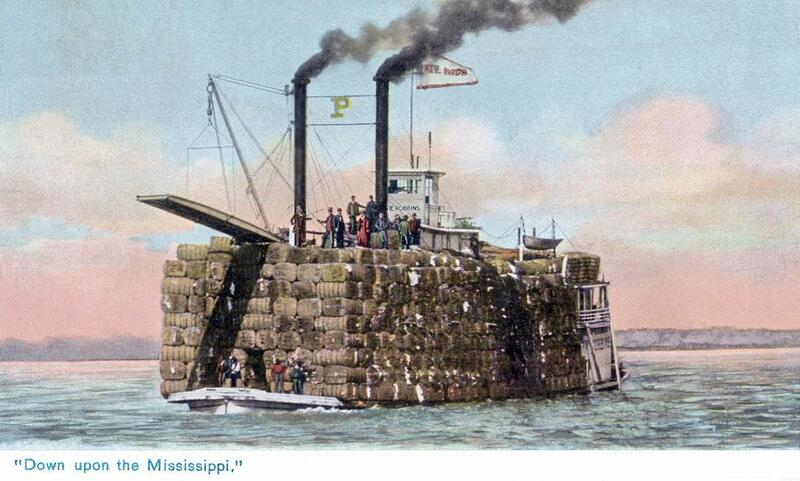 The Natchez had several accidents over the years: November 1896, three miles above Natchez, Mississippi she sank with 1,700 bales of cotton and 8,757 sacks of seed. Accident occurred as a result of dried hull seams. 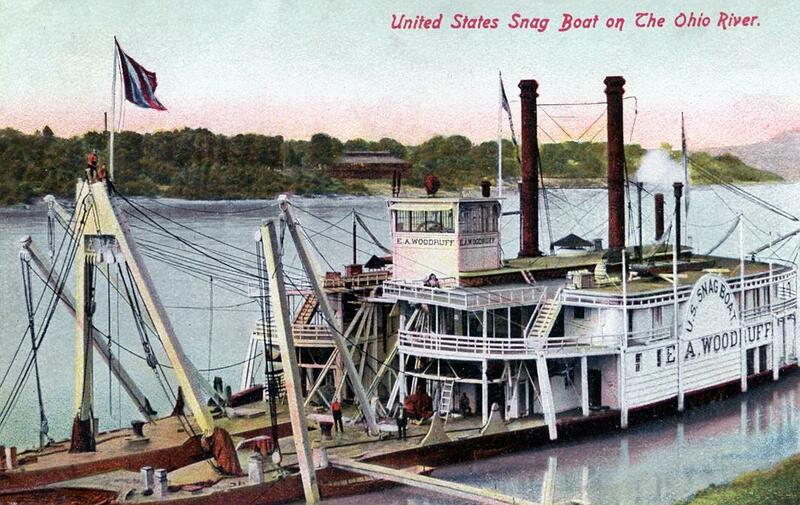 In early February, 1897 she hit the shore at Cottonwood, 20 miles below Vicksburg. 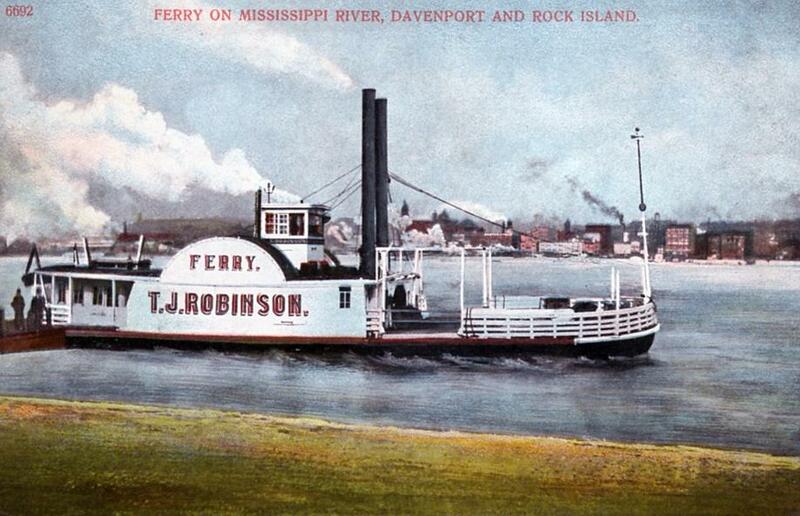 Mississippi and tore away the jack-staff and stages and toppled her chimneys. She also sank at Ford's Crossing, 12 miles below Natchez in November, 1899. In 1902, Captain William A. Duke became master. She received new boilers in July 1914 and in 1915 was sold by the U.S. marshal for $6,500 to Capt. Duke. Captain Duke ran her in the New Orleans-Cariola-Grand Lake trade where she was often laid up for long periods. In 1918, she was dismantled. Nice coloring job on this old postcard and with flags upgraded 'tis a thing of beauty . . . Her bell came from the CITY OF CINCINNATI. Ran in the Louisville-Evansville trade. She was taken to Cincinnati in 1910 and had 25 feet added to her length forward of the boilers. She then ran in the St. Paul-Davenport-Stillwater trade under the command of Captain Walter Blair. In May 1914 she made a special trip from Davenport to the Tennessee River. By June 1914 she was back running in her usual trade. 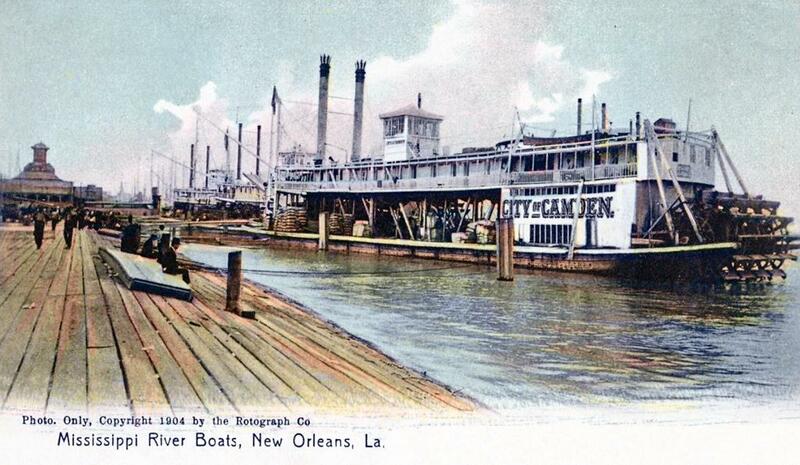 In the fall of 1915 she made a tourist trip from St. Louis to New Orleans. In May 1916 she made a Davenport to Florence, Alabama trip. She was made into a full-scale excursion boat continuing in the Cincinnati-Coney Island trade until she burned at Cincinnati on November 4, 1922. Her roof bell went to the GENERAL WOOD while she was in the Coney Island trade. Original price $19,000. Home port or owner's residence circa 1893, New Orleans. Got in a hurricane at Mobile (1906) and was blown out on mud flats and dismantled in 1910. From the 1930's and into the '50's one of the "fashions" in postcards with jumbo letters that each contained photos of the town, city or state that it depicted. 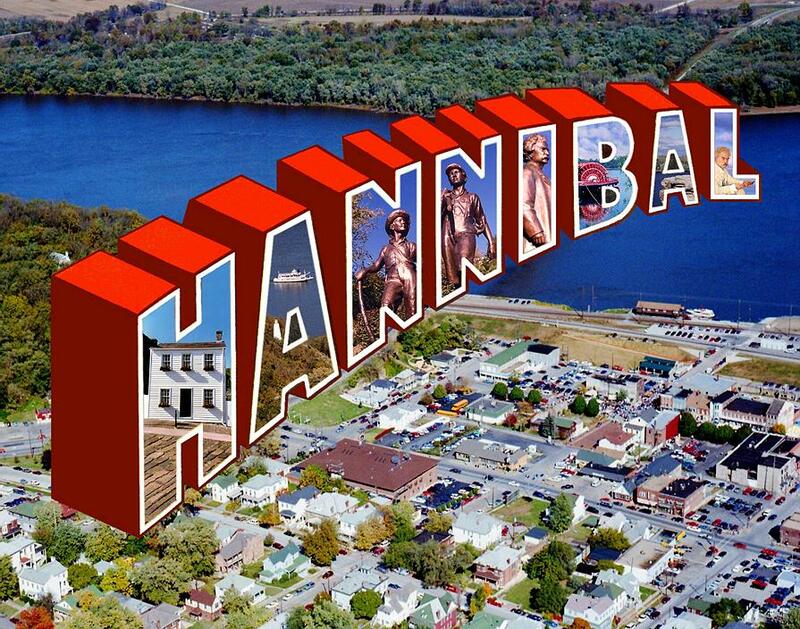 I scanned the one of HANNIBAL, Missouri then cleaned up the sides and replaced all the images with my own. In this particular composite I placed the whole thing over a detail from an aerial photo I took from a little single engine plane flying over Hannibal and the Mississippi in October 1995. It worked out pretty nicely. I also placed the design over other photos of Hannibal that included the river and familiar landmarks. 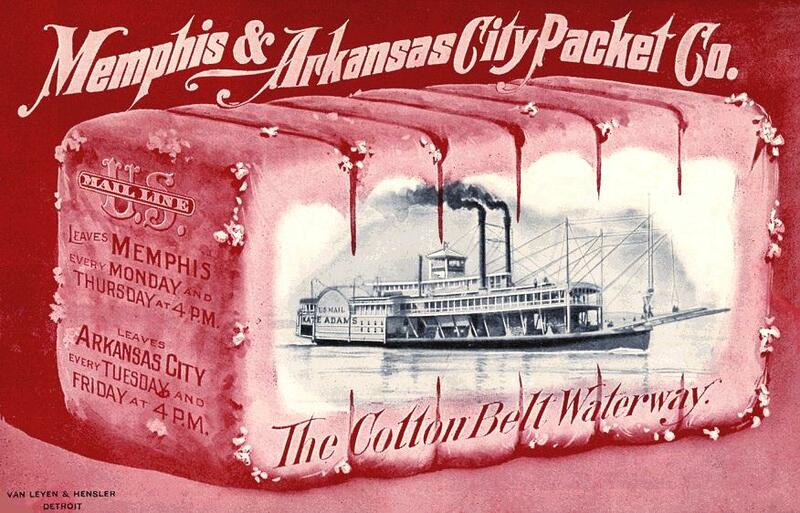 Promotional postcard for the Memphis & Arkansas City Packet Co. featuring the first Kate Adams. Major John D. Adams was owner of the boat and head of the company. Nice old timey advertising. 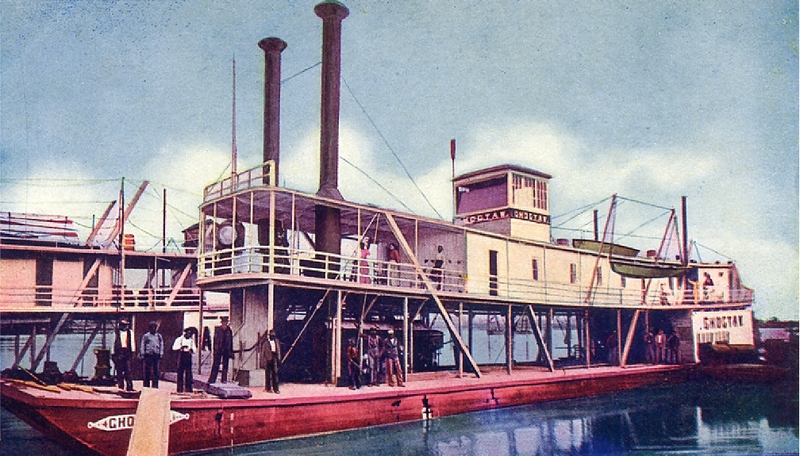 This is the Steamer Choctaw; one of my favorite postcards. Captioned: "Wharf Scene, Little Rock. Arkansas." Can't remember if I ever sent it previously. The boat is so simple and modest, yet the retouch artist managed to get carried away and surpassed themself by creating something approaching a work of art. I can't quite put my finger on why it's so intriguing, maybe it's the dynamics of the vertical and diagonal lines and of course the color, particularly the magenta hull, and those rather over-simplified clouds. Probably just another banal day's work for the retouch artist but somehow they managed to glorify the commonplace into something out of the ordinary, perhaps even bordering on the surreal? Well, you'd know better about that than me. 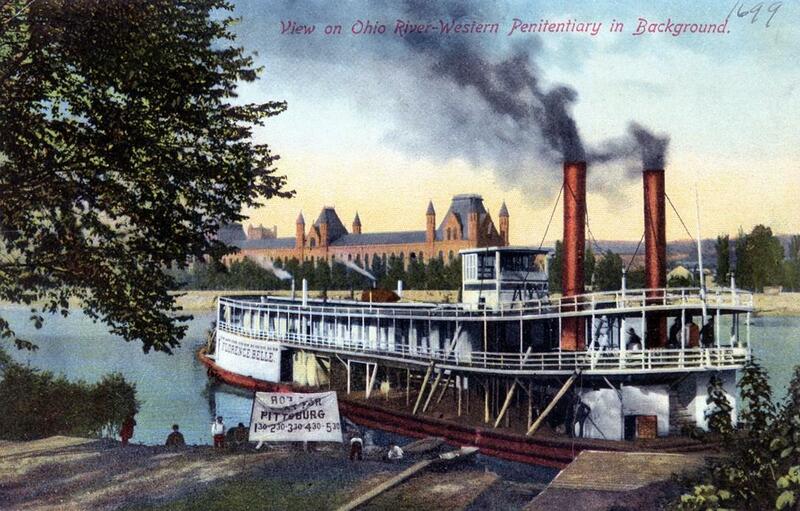 "The Florence Belle on the Ohio River with the Western Penitentiary in the background" (located in Pittsburgh, PA) The postcard was published by The Pittsburgh News Company and printed in Germany by Druck Chrome. Many years ago I loaned this postcard to Ralph DuPae who had it copied for the LaCrosse collection. (It can be identified as the same one by the handwritten number 1699 in the upper right corner). The image on the LaCrosse site is displayed in black and white. A canvas sign stretched over a display board on shore advertises ferry service to Pittsburgh hourly from 1:30 pm to 5:30 pm On the reverse of the un-post marked card is handwritten in pen: "Boat landing at Brunot's Island where race track is located." From 1903 to 1914, the island was the home of Brunot's Island Race Track. Brunot Island (also known as Brunot's Island) is a 129-acre island in the Ohio River at the west end of Pittsburgh in Allegheny County, Pennsylvania. It was named for Dr. Felix Brunot who settled the island with his extended family in the late 1700s. The family entertained the Lewis and Clark expedition on the island in August 1803. The island is now home to the Brunot Island Generating Station, a fossil fuel power plant. The Ohio Connecting Railroad Bridge crosses the Ohio River at the island. The island does not otherwise connect to the land, and all vehicular traffic must use a ferry to access the island. The employees of the power plant use a pedestrian walkway on the railroad bridge to go to work. The walkway is not accessible to the public. State Correctional Institution - Pittsburgh (historically known as the "Western Penitentiary" or the "West Pen") is a low-to-medium security correctional institution, operated by the Pennsylvania Department of Corrections, located about five miles west of Downtown Pittsburgh and within city limits. Located on the banks of the Ohio River on 21 acres of land. (12 acres within the perimeter fence.) It was the first prison west of the Atlantic Plain as well as a major Civil War prison from 1863 to 1864. Owned by Captain H. Page Hudson, Freeport and Captain T. P. Hudson. The BELLE came out in April 1895 in the Allegheny River trade, Pittsburgh-East Brady. In May 1897, she made a trip to Oil City, Pennsylvania and took out excursions to Indian God Rock, the last steam packet in that area. Her partner in the East Brady trade was the NELLIE HUDSON No. 3. She transferred to the Pittsburgh-Morgantown trade, Monongahela River in the summer of 1897. Originally her pilot house was forward on the boiler deck; in spring of 1898 it was raised on the roof and the boiler deck extended forward. She made a special trip to Fairmont, West Virginia arriving there on May 18, 1898. A number of persons from Morgantown made the trip. Telephone lines and cable wires were cut and parted at several places. Three boats had been to Fairmont prior: the ELECTOR, the WEST VIRGINIA (in 1872) and the towboat HARRY. The BELLE was cut down by ice at Creighton, Pennsylvania, December 20, 1909 (some sources say January 17, 1910). The estimated cost of her loss was $5000. Built at Sterling Island, Illinois, 1898, originally the excursion steamer JACOB RICHTMAN. Prior to 1904 bought by Clat Adams and his brother of Quincy, Ill.. Burned in Quincy Bay, 1904, having been renamed. Rebuilt and by 1910 was owned by the Missouri River Excursion Co., Capt. E. H. Mattheus, master. While backing away from the landing at Kansas City, Mo., on May 18,1910, she collided with a sand barge and sank after having been run ashore. There were 95 passengers on board but no life loss due largely to John J Pryor, one of the owners who, although he could not swim, stood by and saw all safely ashore. The hull was shaped like a bootjack with a "Shreve snag beam" between the double bows at the waterline. Lengthened at the Cincinnati Marine Ways in 1885. Operated the entire length of the Ohio River. Captain Christian commanded her for about 25 years. One of her early jobs was to remove the wreck of the sidewheeler PAT CLEBURNE in November 1876. When she was retired in 1925, Captain Gordon C. Greene was high bidder on her. After Greene died in 1927, she was sold to the Louisville and Cincinnati Packet Company and became a wharfboat at Louisville, Kentucky. In 1940 the Greene Line, then owners, built a new wharfboat and the remains of the WOODRUFF were sold to the Ohio River Company, who beached her at Catlettsburg, Kentucky where she was dismantled. Irvin S. Cobb, novelist and dramatist who acted in occasional US films of both silent and sound eras. In 1916 when Cobb was 40 years old, and 19 years before he co-starred in 1935 at age 59 with Will Rogers in STEAMBOAT ROUND THE BEND Irvin S. Cobb was already the local hero of Paducah, Kentucky where a local cigar company and its product were named for him. 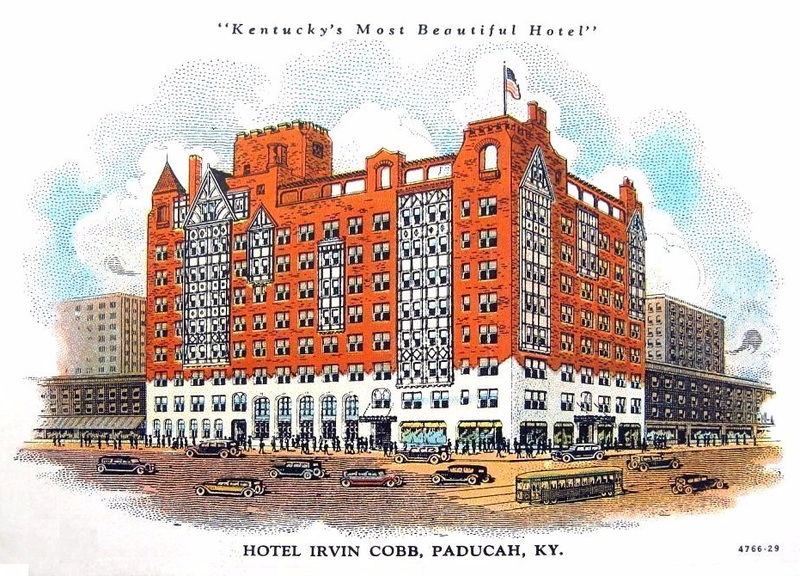 Paducah's HOTEL IRVIN COBB was built between 1927 and 1929 and is now an apartment house. The HOTEL IRVIN COBB was constructed between 1927-29 during the era of a rollicking economy at a cost of $400,000. During its period of operation, the COBB drew more state conventions than any other place in western Kentucky before the development of state park resort centers at Lake Barkley and Kentucky Lake. - The Courier-Journal, Louisville, October 29, 1974. Paducah, originally known as Pekin, was settled around 1815. Settlers were attracted to the community due to its location at the confluence of the Ohio and Tennessee Rivers. The community was inhabited by a mix of Native Americans and Europeans who lived harmoniously, trading goods and services. In 1827, William Clark, Superintendent of Indian Affairs for the Mississippi-Missouri region, arrived in Pekin with a title deed to the land he now owned, which was issued by the United States Supreme Court. Clark most likely took stock of the settlers that had arrived at some point before himself, and offered the land for purchase, so they could occupy it with title in their name. If they did not choose to purchase the right to occupy the land, they most likely relocated to another domicile. The town was platted out and named in honor of the largest nation of Native Americans that ever roamed North America, the Padouca Indians. Lewis and Clark had made acquaintance with many of them while on their trek west. The community was incorporated in 1830. 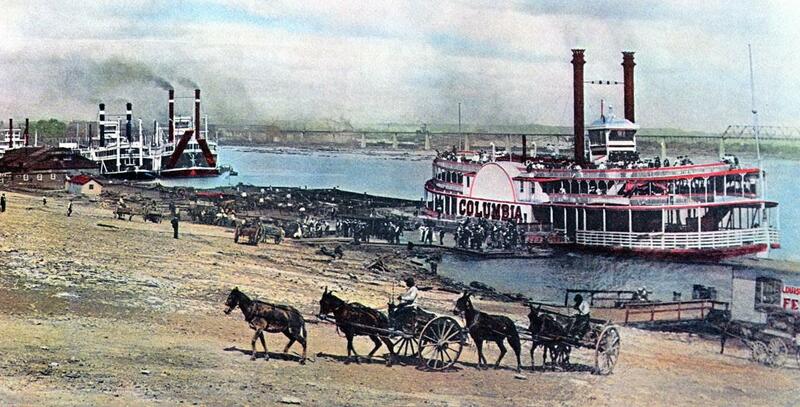 Paducah thrived due to its port facilities along the waterways that were used by steamboats. A factory that manufactured red bricks was established and a foundry for making rail and locomotive components was built, ultimately contributing to a river and rail industrial economy. 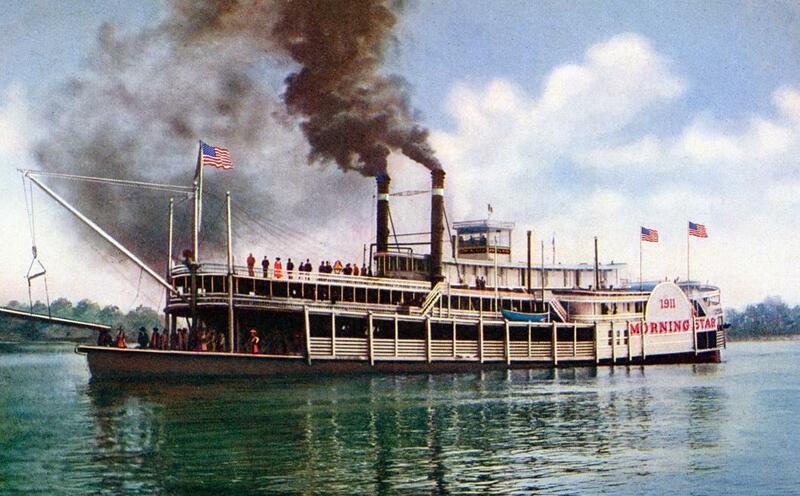 In Cobb's 1942 memoirs EXIT LAUGHING he wrote a colorful history of steamboating at Paducah. There never was but one Paducah; there never will be but one Paducah. So Paducah's loyal, boastful children claim. I'm claiming it for her, too. I was well along in my teens before the inter-related steamboating interests ceased to dominate the picture. Until then the river either touched the lives or furnished the living for nearly every household and tragically took its toll from them too. From the very beginnings, when a cluster of log huts sprang up about a wood yard and a hand-ferry at the mouth of the Tennessee, this had been true. Indeed there might never have been any town here at all were it not for three great rivers funneling together within a stretch of fourteen miles to feed into the nearby Mississippi a flow almost as great as the mighty mother stream's. Or if there were a town decreed it could have found its place in the range of low hills farther back, rather than along the flattened lands facing the low banks where floods could menace it and, on occasion, devastate it. On a single day in the flush years I've seen ten or twelve steamers, lordly deep-bellied sidewheelers and limber slender sternwheelers, ranked two or three abreast at the landing; and the inclined wharf, from the dry-docks almost up to the marine ways, literally blocked off with merchandise incoming or freight outgoing-cotton in bales, tobacco in hogsheads, peanuts in sacks, whisky in barrels and casks, produce and provender of a hundred sorts. Transfer boats, and ferryboats and fussy tugs and perhaps a lighthouse tender or a government "snag boat" would be stirring about; both of the squatty scow-like wharf boats bulging with perishable stuffs; "coonjining" rousters bearing incredible burdens and still able to sing under their loads, swearing mates and sweating "mud-clerks"; drays and wagons and hacks and herdics (a "herdic" was a low-hung public carriage of the late 19th-century with a back entrance and seats along the sides) rattling up and down the slants; twin lanes of travelers dodging along the crowded gangplanks; a great canopy of coal smoke darkening the water front; a string band playing on the guards of some excursion steamer; maybe, for good measure, a calliope blasting away from the top deck of a visiting showboat such as French's New Sensation, or Robinson's Floating Palace, or Old Man Price's; scape pipes shrilling and engine bells jangling; and, over-riding all lesser sounds, the hoarse bellow of the whistle between this or that pair of lofty stacks as one of the packets gave notice of her departure. Barring flood times with which no human hands could cope, only midsummer brought a slackening-off in these profitable ramifications; not always though but frequently. Those years the channels shoaled and kept on shoaling until the bars stood up high, like great turtles bleaching their backs in the heat, and the "chutes" went bone-dry and in the formerly convenient "cut-offs" only the catfish and the gars and the buffalo fish might navigate - and sometimes even they got sunburned. Regular liners hunted the bank then and stayed there, and the owners fumed and prayed for torrential rains at the headwaters and the pessimists amongst them lamented that in this accursed business it was always either a feast or a famine; while the crews temporarily transferred to the "mosquito fleets," these being chartered boats of such skimpy draft that, as the saying went, any one of them could run on a heavy dew. But let a general break occur in the weather and the lean pickings would be at an end in a jiffy. And pretty soon then, coming on the crest of the fall rise, the big towboats from the "Head of the Hollow" would go chugging by out in mid-current, each one shoving acres of loaded coal barges before her squared bows, and their yawls racing in for provisions and supplies, then racing back out to overtake the plodding convoys. This also was an approved season for the lumbermen to drift down the Tennessee with their huge rafts, and the rafts would be broken up and the timbers imprisoned by the thousands within the "gunnels" of the sawmills and the woodworking plants along shore. Some of the raftsmen got impounded too-in the calaboose. For with all that good log money in their pockets they went on most gorgeous sprees. Later, when ice had locked the Missouri and the Upper Mississippi and the Upper Ohio, the inner two-mile stretch of Owen's Island, for all the way between the lower towhead and the farther tip where it aimed at Livingston Point, would be lined and often in favored anchorage double-lined and triple-lined with all fashion of craft brought hither to "lay up" in the safest winter haven for a thousand miles of tributary waterways - the famous Duck's Nest. And over on the town side, snuggled amongst the protecting fringes of willow and cypress where Island Creek emptied in, would be a jumble of "shanty boats" and "joe boats" populated by amphibious guilds: fishermen and trappers and market-gunners; poachers and foragers; cobblers and tinkers; peddlers, fortune tellers, "root-and-herb doctors," itinerant preachers of curious creeds; ginseng-diggers, tie-hackers; mussel-dredgers; owners of "tintype galleries" and penny peep shows; floating junk collectors, Cheap Johns and Jacks-of-all-trades, dealers in live bait and in notions and knick-knacks and dubious patent medicines, all hibernating together until spring sent them voyaging upstream or down, with their babies and their dogs, their trotlines and their gill nets, to spend nine months of pure gypsying. Now water-farers, whether the water be salt or fresh, have always been a separate subspecies, more picturesque than plodding stay-at-homes. It was so with us. Our deck hands were swaggering bravos who talked a strange professional jargon and counted themselves a hardier breed and a more reckless one than their brethren ashore. Our mates notoriously were trigger-fingered. Once aboard, masters and pilots became imperious overlords. It was a chancy calling which these mariners of ours pursued and they carried themselves accordingly. If you couldn't snap your fingers in the face of danger you couldn't qualify. For the river, which gave these men their daily bread, was not alone an uncertain provider but a most fickle mistress. There was no taming her. She was like a snake which wriggled sluggishly along in seasons of drought, only to strike, like a snake, when the onrushing freshets put a twisting, swirling viciousness into the swollen coils. Moreover, what with boilers to blow up and snags to rip the bottoms out of lightly built hulls and fires to turn the matchwood upper structures into flaming furnaces and some quick fierce storm to capsize a heavy laden carrier, it was a small wonder - it was no wonder at all - that the lines of graves in the cemeteries were punctuated with the headstones of those who had lived by the river and by it had lost their lives. Sometimes the same surname recurred on the slabs. For there was a clannishness, a sort of freemasonry about the whole thing. If your father "followed the river" it rather was expected that you, growing up, would travel the same lane. For a typical example take my father's case. As far back as 1818 his grandfather, shrewd and forehanded Vermont Irishman that he was, had given up keelboating to buy part ownership in the first steam-driven craft that plied the Cumberland River. At the peak of the family fortunes my father's father controlled a small fleet of short-haul steamers, manned largely by his own slaves. And my father himself was a steamboatman with a master's license and, for the better part of his life, a place as traffic manager of a navigation company, so that the unbroken span of operations for his people extended through upwards of seventy years. So it went. If you were a Rollins or a Pell or a Cole or a Beard you almost inevitably were destined to be a pilot. There were eleven Pells who had held pilots' papers, including "Yankee" Pell who, against his private principles, had been pressed to steer a Federal gunboat, and "Rebel" Pell who quit his wheelhouse to fight uncle' Forrest; Slick Pell who was smooth-shaven and Curly Pell who wasn't; Big Ed and Little Ed, Old Charley and Young Charley and Young Charley's Charley, all sizes and ages, but all Pells. The Dunns were usually were pursers, just as a young Hoey or a young McMeekin was a potential mate, and a Dozier was destined for an engineer's berth. An Owen inevitably would be in the ferryboat traffic. Through three generations the Fowlers were steamboat owners- the name was renowned from New Orleans to Pittsburgh, for they also owned wharf boats and a "boat store." And the lives of two of them were sacrificed to the greedy waters. One, before my time, burned to death after a boiler exploded and the other, a handsome promising lad serving his apprenticeship as a junior officer, was drowned doing rescue work when a sinking occurred in the nighttime. My mother's eldest sister was married to one of these Fowlers, who died fairly young from the after-effects of the privations he had endured as a trooper in Morgan's Cavalry; hence, submitting to a cruel edict then prevalent, she wore the mourning garb ordained for widows for almost half a century until the end of her days. Those black folds cloaked a lady whose tongue was a lancet tipped with a mordant and a devastating humor. Most witty women, I've noticed, do carry chilled-steel barbs in their wit. My Aunt Laura stung her victims in a mortal spot and left them where they fell. In her circle of intimates was a rather elderly spinster who so flutteringly was taken up with good deeds and club activities that she sometimes overlooked the soap-and-water attentions which a less zealous gleaner in the grape arbors of the Lord might have bestowed upon herself. In her absence-which was fortunate for all concerned-someone referred to this devoted Dorcas as being wishy-washy. Up spoke Aunt Laura. "She may be wishy," she stated briskly, "but God in Heaven knows the woman is not washy." Originally the AUGUSTA, she was renamed between 1903-1905. Operated at Rock Island, Illinois. Extensive repairs were made to her in 1908 after which she continued doing good business. Sometime after 1908 she was renamed ROCK ISLAND. "The Louisville, Kentucky waterfront was a busy place in the steamboat days of 1899. We could find from left to right, the Louisville Boat Club wharfboat, the TELL CITY, an Evansville packet, the CITY of CINCINNATI, a mail packet, the JOHN K. SPEED, a Cincinnati and New Orleans packet, and the COLUMBIA, a Jeffersonville, Indiana ferry. Freight piles are scattered in convenient places on the levee and mule carts and drays hustle among them. The picture was taken looking west from the foot of 4th Street."